During your stay at Super 8, we are sure you will find rooms that satisfy corporate or leisure needs, with various room types from which to choose. Room amenities for all rooms: Air Conditioning - Cable/Satellite TV - Color TV / Free Local Telephone Calls / Telephone / Non Smoking / Outdoor Pool. 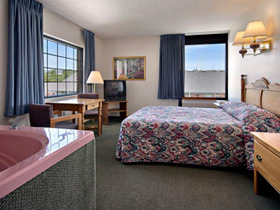 Branson Super 8 is family owned and operated. Your hosts Pete and Elizabeth Capko work hard and expect your stay to be nothing less than excellent. Regardless of the purpose of your visit, Branson Super 8 gives you easy, nearby access to all that Branson has to offer, from world-class entertainment and outdoor recreation to shopping and restaurants, all along Branson's famed 76 Country Boulevard. We are 100% NON-SMOKING and our rooms are all smoke free. Each evening we bake Fresh Cookies for our guests to enjoy!